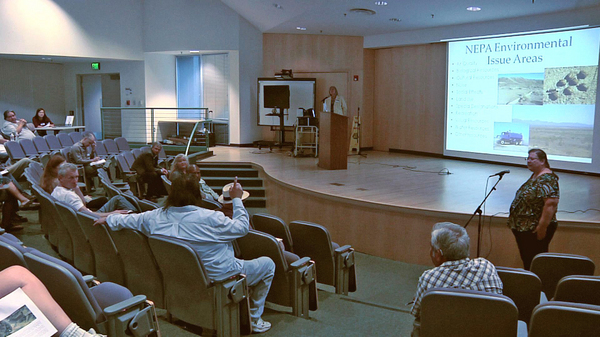 During the course of shooting for his film “Who Are My People,” discussed at length in my piece in East CA, Filmmaker Robert Lundahl attended a September 15, 2012 scoping meeting for the proposed Rio Mesa Solar Electric Generating Station in Riverside County, later mothballed by its developer. He captured on video what seems to be a remarkable failure by the Bureau of Land Management to live up to the agency’s legal obligations to consult with Native tribes, and he’s made that available to us here. Attending the meeting where I was greeted by name upon entry I realized there was a lack of clarity whether the meeting was a public meeting or a Section 106 compliant government to government consultation. Some tribes were missing…. I realized that something was deeply amiss. Under Section 106 of the National Historic Preservation Act of 1966, the Federal government must consult with Tribal governments on a “government to government” basis when a federal agency project runs the risk of affecting historic or cultural features important to the Tribes. That consultation must take place whether or not the potentially affected site is on Tribal land. As the California desert is pretty much chock-full of culturally and religiously sites important to one or more of the Native groups here, you’d expect the BLM to pay close attention to procedure. Often enough, once consulted, a tribe will respond that they have no objection to a project proceeding. But in 2012 in the California desert, representatives of desert tribes were already reeling from three years of their cultural sites being threatened without sufficient Section 106 consultation. So when the Rio Mesa project came along, many people in the Tribes were already angry, and they’d made that fact known to the BLM for some time. There have even been a number of lawsuits over inadequate Section 106 consultation for California desert solar projects. You might expect that the BLM would rise to the occasion and do that consultation right, in unambiguously government-to-government talks with meticulous records kept. Nonetheless, Lundahl captured BLM representative Lynette Elser saying, during the September 15 scoping meeting in Blythe, that none of the BLM representatives present at the meeting could likely remember which Tribes had been consulted under Section 106 requirements, though she said that consultation had begun nearly a year earlier, in November 2011. Elser’s statements were met with rebuttals from some of the representatives of the tribes in attendance, notably the Fort Mojave Tribe’s Ron Van Fleet, who said his tribe had not received any formal request for consultation on Rio Mesa under Section 106. ReWire attempted to contact John Kalish, Field Manager of the BLM’s Palm Springs office, to offer his agency the opportunity to respond or to explain what happened at that meeting. We haven’t yet heard from Kalish, but the invitation remains open.